Colin Zalewski demos Simply Measured, a full-funnel social analytics tool that will transform how your business measures social. Check out the video below to learn more about Simply Measured‘s social tracking superpowers. Jay: Hey everybody. This is Jay Baer, founder of Convince & Convert, and welcome to another episode of Marketing Marvels, the show where I bring you marketing technology that you can use day to day to improve your business. Every episode of Marketing Marvels includes a conversation about a software platform that you’re gonna wanna know about and a quick demo of that software. We talk a little bit about who it’s for, what it costs, and how you can get it ASAP. Today, super excited to have on the program my friends from Simply Measured, a terrific social analytics platform that takes a real end-to-end approach to understanding how social media is impacting your business—not just at the very, very end of the funnel but all the way through the funnel. Really interesting stack. You’re gonna see it in just a minute. 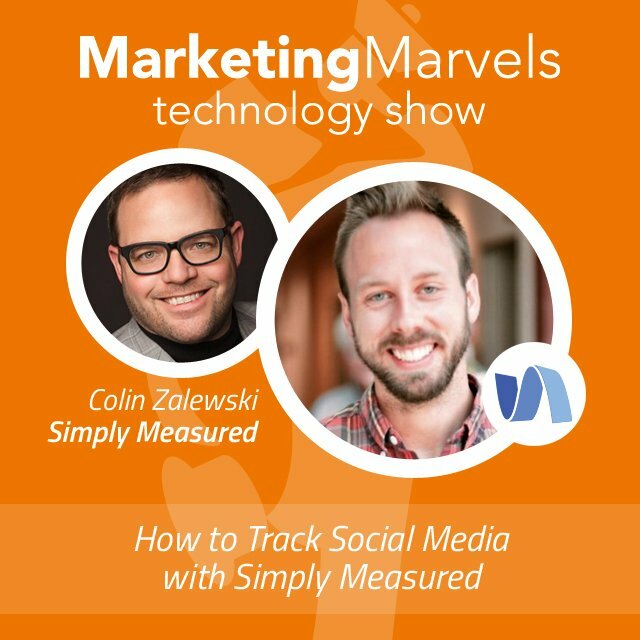 Joining us from Simply Measured to show us the tool, talk a little bit about it, what they’re up to, is Colin Zalewski, who is their Product Marketing Manager. Colin, welcome to Marketing Marvels. Colin: Thanks, a lot Jay. Excited to be here. Jay: Delighted to have you guys. And I think what Simply Measured is doing in the market is really fascinating because there’s a lot of social analytics tools out there. There’s a lot of listening tools. There’s a lot of tools that can tell you how your Facebook is performing, or how your Instagram is performing, or how you Pinterest is performing, or whatever, but you all have taken a very comprehensive approach to analytics and built a lot of different pieces into the system. I think there’s four different components to the platform now, is that right? Colin: Yes, yes. We’ve grown a lot from what people may have thought of us back in the day when we first founded and decided to share with everybody where we’re at. Jay: Yeah, and it’s really interesting because so many people have multiple of these tools already, right? If they don’t have Simply, they may have a bunch of different licenses that are doing a bunch of different things in their organization, and that can get a little cumbersome and expensive. ‘Cause you’ve got one license for this and one license for that, and it ends up being pretty costly and kind of occludes right? ‘Cause you may get some inconsistent data. You’ve got different people on your team running each tool, so you’ve got some knowledge gaps as well. You’re trying to end all that. You guys call it the Frankenstein funnel, which I think is hilarious, trying to get rid of that and giving social marketers one tool to do, maybe not all of they’re jobs, but a lot of it, right? Colin: Yeah, yeah. The concept of the Frankenstein funnel is, basically, how are you going to realistically patch together all these different tools that you’re relying on to measure different points in your buyers journey and social’s impact? At the top you’ve got listening tools, right, that are looking at who’s talking about you. How many people are aware? You’ve got some typical analytics tools out there looking at engagement and audience growth. And then you’ve got web analytics, and maybe you’re using click-counting tools to look at how people are coming from social to your website and beyond. And like you said, Jay, you end up with these gaps, these inconsistencies, and you kinda have these trust issues, right? Plus you have this added overhead. You’re signed up. You got a bunch of contracts floating around, and you’re trying to keep track of your passwords. In the end, that’s where we get the Frankenstein funnel. You got a lot of marketers out there that are trying to sew together these different disparate technologies to try to paint a complete picture. We don’t think that that’s cost effective, we don’t think it’s effective for your workflow, and we frankly don’t think that you’re gonna really learn much to actually be better at your job and have bigger impact at your organization. So we set out to solve that. We wanted to go top to bottom with a solution that does full funnel social analytics, and that’s what we have for you. Jay: Fantastic. Let’s take a look at some of the highlights, shall we? Turn on the suite chair? Colin: Yes, absolutely. So as we get started here, I just wanna make it real simple for everybody out there as you think about what Simply Measured offers. To organize it by the funnel, typical funnel, you got how many people are aware of us. We use a listening tool to talk about how many people are aware of your brand on social and who’s talking about you. Secondly, how many people are engaged with your brand and considering you, and who needs to be educated about the products and promotions that you have available? So we have an analytics solution for you which we’ll walk through next. And then also, as people take that leap from social to your website, and then maybe even become a customer or lead of yours, how do you measure social’s impact on that? And so lastly, we’ll round out our conversation today by talking about the bottom of the funnel as social drives an impact there. To get us started here, we’re looking at Simply Measured Listening. The Quick Facts is a great place to start; it gives you a lot of these ad hoc answers for folks as they’re walking past your desk, or if you work in an agency and you’re getting those random emails from folks going, “Hey, that campaign that you just ran, how many people mentioned us? What’s the sentiment on it?” This is a great place to start to answer those easy questions. I like to point out to folks that this is really a good way to find entry points. You login, you get a dashboard, you see a bunch of numbers. Let’s find an entry point to actually do some analysis with this data, and I like to start with a good old fashioned word cloud. Now what we’re looking at here is a topic for Under Armour. When you sign up for Simply Measured, we set up topics for you, and basically, we’re creating a query to go out and listen across a number of different social sources for conversations that are happening about your brand, your category, different products that you offer. We also have a lot of customers that are listening to competitors and what they say. Jay: Are you listening now, Colin… are you listening also to blogs and places like that as well, or is it primarily social channels per se? Colin: Yeah, definitely. So we think pretty broadly about the way that people think of the term social here which includes blogs, forums, review sites. Really when people are communicating online that’s social to us. Colin: We wanna listen there as well. Colin: Definitely. One of the things that I like to look for when I’m looking at word clouds is who else is being mentioned? That’s really what this word cloud is about is when people talk about Under Armour. What else are they saying? So we’ve got Gym Life. They’re talking about Steph Curry here. If I work at Under Armour, I’m pretty interested if I see Nike here involved as well. I can add that as a quick filter, and now I’m doing some competitive analysis. In fact, I can even scroll down and see, hey, when people talk about my brand and Under Armour, and Nike, what’s the sentiment? Are they speaking positively? In fact, I can see in Under Armour’s case here, when Nike’s also mentioned, there’s a really high level of sentiment. Now this is not insightful for somebody that works at Under Armour to just say, “Hey, Nike’s a competitor of yours.” Of course. That’s not really groundbreaking by any means. But what it does tell you is that there’s an opportunity here to maybe learn a little bit more about who these people are that are talking about you and your competitor. To do that, we jump over to Demographics. So we’ll break down here for you by gender, male, female, of course, different age ranges. And I think this is really powerful, especially for brands that are national or even multinational, to look at where people are geographically located when they talk about you. Jay: Under Armour’s so strong in the northeast and mid-Atlantic, based in Baltimore, that you can see a real concentration there. Colin: Yes, yeah you’re totally right. And then it’s really interesting. I’m a west coast guy so maybe I’m a little biased here, but I’m interested in things like San Francisco where the number one brand ambassadors for Under Armour is Steph Curry. Or I can see central California here, and there was actually a golf tournament this weekend that Steph Curry played in at Tahoe. Interesting to see how people might be talking about him and Under Armour there as well. Actually, I just was on the phone recently with one of our customers who works with the LPGA. She’s really interested in what’s going on with the US Women’s Open. It’s at the Trump National Golf Course. A great way to use geographical filtering to see what people are talking about around a given area. So you can actually say, “Hey, people that came to this tournament. What are they talking about?” We can add some filters here as well. So if we’re interested in maybe what, let’s say, women between 25 and 44 are talking about, we can just add filters really easily here. Make a search, and we’ll filter down. And if we wanna get a sense for how much people are talking, we just go over to Volume. This is gonna tell us for this timeframe, what is the volume of conversation, and again, taking into account these filters. So women between these age ranges, what are they talking about, but also, how often are they talking about your brand? Jay: I see some alerts there flagged in the bar chart. Are those automatically flagged or are those flagged by the user? Colin: Yeah, so we do flag those automatically, and really what we’re looking for is significant changes in the standard deviation. So in this case, it’s based on increases in standard deviation on volume. And of course we wanna call that out for our customers that this is something that is really worth paying attention to. And then of course on the other side, you have significant drops. So it’s not just about those spikes but also those valleys that are worth looking at as well. Colin: Last thing I want to show you here in Listening is the comments. So this is where we’re actually looking at what’s being said. And again, in this case, we’re actually looking at females here between 25 and 44, and we can start to find folks that have great influence on your audience. So I can sort them by influence. And now I’m looking at folks that have mentioned Under Armour or are talking about you already . . . are within this demographic. And I can start to think about, “Are these potential partners of mine?” Especially as you’re looking for influencers, these are the folks that are rating by influence based on their own social following. These might be people that you’d actually consider reaching out to. I’m sure you hear this all the time, Jay. Influencers is a big topic; it continues to be a big topic. One of the things I get asked a lot is, “How do I find these people? I’m happy to email them and talk with them, but how do even I find them?” This is a great way to actually start finding some people that might be good partners for you because they have extended reach. And you can do it within a given demographic that’s a target for you. Jay: Yeah, I mean somebody who’s already talking about your brand is a much more likely influencer in terms of wanting to participate with you than somebody who is not already talking about you. Colin: Yeah, it’s a great point right? It may be challenging to build that partnership with somebody who doesn’t really have much of an attachment to you already. But somebody who’s talking about you, they have a positive sentiment. They are peers with the target audience that’s important for your brand, those are the folks that you want to be partnering with. Colin: Let’s jump over here into Social Analytics. So as we move down the funnel, right? Now we’re talking about people considering your brand. These are folks that are following you and folks that are not following your social profiles and how they engage with you. And so what we’re looking at here is our analytics dashboard. We’re gonna load up some profiles really quickly here. I like to look at Bravo TV; they’ve got some interesting things going on on social. I load up their profiles, and now we’re getting that cross-channel view of everything that’s happening across their profiles. I can, of course, filter by date, channel. I can apply some advanced filters here. So by media type, if on Facebook it’s a published or unpublished post. So I can start to get a pretty good view and kind of hone in on what’s most important. I can change my view here, so I can either look at total engagement. We actually unify these different engagement types across channels, right? So somebody re-pins on Pinterest and they share on Facebook . . . that’s really the same type of engagement, which is how we create this cross-channel model. So I can do something like look at sharing activity, and again, we’ll unify it across the channels. And if I see something that really sparks my interest, like I see a spike here in activity on Facebook, I can click on it, and it’ll actually take me into the posts that received engagement that day. This is the thing that I get asked a lot, Jay, and what our customers have asked us that kind of inspired this part of our product the most, is, “Okay, I’m looking at data, and it’s interesting. Thanks for counting this for me. But what really drove that spike, or what was responsible for that valley? I want to, obviously, do more of the things that are working and less of the things that aren’t working.” So this is a really simple way to actually just get into what are those posts that are being published that drove that spike in activity. Jay: You bet, and like you said, some of it’s media type. Some of it’s more videos and more photos versus more link posts. Some of it is Instagram… typically gets more engagements than other channels, or at least today, so maybe if you were trying for more total engagements, you’d do more Instagram posting. In fact, you can even take a quick look at which, excuse me, which posts are receiving the most engagement. Maybe even filter it to say, “Just look at photos.” And this helps a brand like Trek be able to go to those contributors globally and say, “These are the types of assets that are receiving the most engagement. You wanna be successful; we, of course, want our brand to be successful on a global scale. Let’s do more of this.” And then they actually saw significant increases in their engagement per post. And it was a way that they actually were able to create some friendly competition on a regional basis, which helped them both unify their brand, because they kind of drove people towards a single goal and elevated everybody’s performance. I also want to jump into a specific channel view here. Yes, they think cross-channel. Yes, they’re kind of putting together campaigns that are broad across their whole social presence, but they also maybe are doing things in a little bit more nuanced way than, let’s say, for Facebook. And so as we jump into a specific channel, you’ll see that our view changes a little bit to reflect some more channel specific metrics. And, again, I can jump into, in this case, specific Facebook posts that are driving activity at that point in time. And I can, of course, export it, if your preferred way to move around with data is in Excel. As many of you guys probably know, Simply Measured has long been an Excel-friendly platform. You can export here and take a look at each one of these posts and the related performance that way. Last thing I want to call out here before I move us forward is shareability. It doesn’t have to just be this individual exercise. We want to collaborate with our teammates as this relates. So I can export, and I’ll get some P&G files which are really quick and easy to drop into emails or into presentations. Jay: Yeah, that’s great. It’s really helpful for the marketer to not spend all their time trying to build the world’s greatest PowerPoint. Is there a way to determine sort of organic versus paid in terms of what that impact is on these posts? Colin: Sure, so if I jump over here and use an advanced filter. I’m gonna go back to our dashboard. Specifically for Facebook, we can break apart here which is gonna be your published or unpublished. The published is going to be representing just your organic activity. Unpublished is going to be activity that’s been boosted. We’re seeing no data here just because I don’t actually work at Bravo, so I wasn’t able to authenticate their profiles. But for your data, for the data that you own, you could get that additional access because you can authenticate it. Jay: From a competitor standpoint, if you’ve got a Simply Measured license, can you drop in any competitor accounts in here, or is that set up when you initially onboard with Simply Measured? How do you figure out which of the social platforms, or social accounts, you can monitor in the dashboard? Colin: Yeah, definitely. So you can do, of course, your own profiles, as well as competitor’s profiles. So that’s actually a good little segue way for me here, Jay, is I’m gonna jump over into a comparative view, which is a great way to do some comparison against what your competitors are doing. So you can add your competitors; you can add brands that you aspire to be more like. Maybe they’re not somebody that you’re really competing with, but you have a lot of appreciation for the way that they approach social and you want to understand it better. Add them, by all means. Jay: Yeah, what can we learn from them? Colin: You’re exactly right, ’cause they’re trying to reach the same people, right? So it’s almost like they’re kinda doing a little AB testing for you. And then you take that, put your own brand messaging on top of it, maybe use some similar assets, and you maybe can actually steal some of that engagement from them. We have this kind of pre-validated strategy when you see what’s already worked with a similar audience. Jay: Yeah, love how fast it runs, too. I mean it’s really quick. Colin: Yeah, we worked a lot to get this snapping for people, right? You talked a little a bit at the top, and it’s absolutely the case, that the reality is that people use analytics because they want to learn about what’s going on, but our customers they need to deliver things too, right? And they didn’t really sign up to be report gen machines. They signed up to be marketers, and we wanna let them do that. We wanna help them do marketing better, not just cull data together. So performance is a big initiative for us as well. Last thing I wanna highlight here in the social analytics product is a reporting solution. This might actually be one that folks out there have seen before. This is kind of our foundation in terms of our product and what we’ve been doing the longest. And what we do here is basically build out a library of use case-based reports. So based on what you need to do, whether that’s present a cross-channel story, or maybe on a specific account, let’s say a Twitter account, all you have to do here is actually schedule these. You can, of course, generate them ad hoc. A lot of our customers schedule them, so every Monday morning when they show up to work, they have a Twitter report ready to go for them. Jay: Does that come as a PDF, or what’s the format for that report? Colin: Yeah, it . . . we’ll actually deliver it to you as a . . . I’ll show you a sample here, is . . . we’ll show you in a web viewer, or we’ll also give you the ability to download it into Excel. And we got a lot of folks that really like actually exporting to PowerPoint. ‘Cause then it’s, like, super simple, literally like drag and drop practically, just uplinking it into their own presentations. And folks love . . . this is actually one of the visualizations most famous for Simply Measured is the megaphone. That’s what we call it. And it’s really in that spirit of full funnel, taking you through a journey of what’s happening with your data. And this one of the things that folks have a really hard time doing themselves is telling this data story. It’s why they turn to a provider like Simply Measured to help them. We wanna go beyond just counting things for people. We wanna help them tell an effective story to their coworkers or to their clients in an agency setting. And so we present you with this story based in a use case, and again, as you saw there’s a whole library of different options, this is just one our most popular ones. And people either send these on directly to their coworkers or clients, or they’ll do screenshots, take it outta PowerPoint. You can actually manipulate the data in Excel yourself and drop that into presentations. So you can handle that deliverable part of your workflow in a very efficient way and be able to spend more time actually applying some of the insights that you’re learning. There’s only so many hours in the day; you’d rather spend them doing strategic things rather then some of the more tactical, deliverable range of things. Colin: Last thing I wanna touch on here, just ’cause this is one of my personal favorites and one of our customer favorites is what’s called Content Labels. And this is where you basically are doing campaign reporting. So as you look at different posts, you are then able to apply different labels to them based on, let’s say, brandless, based on the campaigns that you have going on. You could do this based on specific keywords or hashtags that you are mentioning. And so in this example, I can actually select multiple here, and add a label for campaign A. And it will apply it across these different channels, and then I can run a report just like the one I just ran. It’ll be filtered for just the posts that are tagged with that label. So that’s how you break up all these different campaigns; that’s how you break apart these different events that you’re doing. Agencies love this because oftentimes, they may be doing a campaign for a client, but they’re not the only ones posting on that channel, or through that profile, I should say. And so they’re able to actually label and just pull out, “Hey, these are the posts that we published for you, and here’s the value we added,” and take that out of what maybe they have other agencies or their own people doing in the exact same profiles. Jay: I think also in big organizations they’d have tons of divisions, right? You’ve got some posts that are about the camera division, and some that are about the wearable fitness tracker division, and some that are about the peripheral division. And so this allows you to bifurcate that data and run reports just on the social content that impacts that particular line of business. Colin: Yeah, you’re absolutely right. One of our customers is an NFL team, actually, and what they would use this tool for is to go through and actually label posts where they either mentioned or showed Nike products, and then they actually would then go use that to deliver an end of year report for how they drove value through social with their co-marketing partnerships. Colin: So let’s go look at . . . in transition here, as we move our way down the funnel, we’re gonna get into the lower portions of the funnel, which is . . . as people jump over and actually get onto your website and start doing things of value, how do we look at what’s . . . how social contributed to that? So what we’re looking at here is what we call our conversion tracking funnel. This is one of our newest products, one that I’m really really excited about. And this is where we’re looking at how people are coming from different social channels, and I’ll call out this second one here in just a moment, and how they get to your website, what they do when they get there. If you’re offering e-commerce, we’ll look to see if they bought something. If you’re not offering e-commerce, we’ll look at other types of conversions. So maybe they submitted a form. If they’re a B2B company, maybe they created an account. If you are a media company, you want them on your newsletter list, and we give you all kinds of ways that you can compare and slice and dice this data, which I’ll show you here in the next couple of minutes. Colin: So as I get here, and this is really what the workflow is like for our customers, it’s as simple as, “Maybe I wanna share the shoes page here from Garmentory.” I don’t have to manually add a UTM or anything like that. I just copy and paste this URL. You may have noticed that we automatically actually loaded in our own tracking fragment here into the end of the URL. I just copy and paste this, I can shorten if I’d like, put it into my own post, and I’m off and running. The other way, the other reason that we do things the way that we do is . . . I’m actually gonna transition over here into Earned Shares, which is . . . we can track when people go to your website and share content from it. So there’s . . . we talked kind of . . . at the top of the funnel, you got a lot of this earned media that’s driving brand awareness for you. Nobody else is really talking about the power of earned media at the bottom of the funnel. Arguably, the most valuable thing that somebody can do, which is a personal referral, right? You know if I say, “Hey Jay, that’s a really really sweet blazer. You got a link to it?” And you send me a URL to that blazer, that’s a personal referral. That’s a really really powerful activity that’s really important to Nordstrom, or wherever you got that blazer. And you want to be able to track that. So what that actually looks like . . . let’s imagine that I’m a consumer for a second and I’m interested in this pair of shoes on Garmentory. What do I want to do, right? “Hey Jay, I think you might like these.” I’m gonna copy it. Maybe I jump into an iMessage; maybe I shoot you over an email. In a B2B setting, maybe you’re shopping for software or something like that, and you shoot your colleague a Slack, and you send them over this URL. Now you’re driving traffic through social, and that’s what we call . . . that’s basically what we call dark social. So dark social, which you’ll see represented here in the dashboard, is in the color yellow here, or with this chat icon, is traffic that comes to your website from a social source but does not pass what’s called a refer. And what that basically means is a web analytics tool such as Google Analytics or Omniture, it doesn’t have a good way to categorize anything. It gets dropped into what’s called direct traffic, when in fact it’s coming from somebody’s personal referral via social, most commonly through a private messaging app. That’s the simplest way to think of it. Just think, “dark social,” think “private messaging.” That’s the easiest way. Jay: Which as we all know is skyrocketing in use, if you just think about Facebook messenger, if you think about Instagram messages, you think about Snap, you think about all the different places that this is now occurring. It’s far far far beyond Twitter DMs, this is going to be an increasing share of all of your traffic, you gotta be able to measure it. Colin: Yeah, you’re absolutely right. And it even, of course you got WhatsApp, of course you got Facebook Messenger but even something like text, right? Colin: Which probably for most people is the most common way that they communicate with people using their device. That’s also dark social activity. And what’s really cool here is we can walk you down this whole path from how many times people shared across these channels to what they visited, and then maybe I wanna actually dive a little deeper into conversions, and I wanna find maybe some correlations here between how often people share and let’s say when people signed up for my sweepstakes to go to Maui. And I can find which times people are sharing and how that relates to these different channels. If want to actually see what people are sharing this is really really cool. These are actual URLs from your website that people are copying and pasting into their messages. This isn’t creepy, don’t worry, we can’t read your phone number or anything like that. But we can actually tell you in this case the product, we’re looking at sample data here of course to not reveal actual revenue data from our customers. But for this example of a company that sells surf wear this EU t-shirt, that’s beiug shared a lot. And if I go over here and maybe look at sort by conversions to see which product’s being, is actually driving the most conversions, I can see that it’s actually this pair if ET shorts. So what I do with that if I’m a social marketer is I decide, “Okay what is the outcome that I’m trying to drive?” We’re talking full funnel here so I pick my outcome. Where in the funnel do I want to have an impact with this social post? And I find what is it that people are sharing the most for that outcome. If I want to drive some virality, so maybe I want to sort by what’s being shared the most, in that case I’m highlighting and promoting a product that I know people are already sharing from my website a lot. If I want to drive conversions in that case I’m probably sharing that pair of shorts. And probably want to go ahead and put some spend behind it as well. You can spend confidently knowing that you have a high degree of certainty that this is relevant to your audience ’cause they’re already voluntarily going to your website and using social as a means to share it with one another. Jay: Yeah, it’s a great point that you’re essentially guaranteeing that it’s gonna work at least some because you’ve already seen evidence that it’s going to work. Colin: Yeah, I think actually one of my favorite stories of this is actually from our friends at Garmentory who we were talking about earlier. They used this principle, they’re using our products, the thing that was most interesting is this dark social element, is what are people sharing privately from their website? And so they started looking at these products and the type of products that are being shared the most and they used that to educate where they’d boost their posts on social. And just reading off some of their performance here Jay, 24% increase in business. What I did is I compared the, I compared their 60 to 90 days, so month three versus month one using this product after making some of these tweaks. 24% increase in visits, 15% increase in page views, 19% increase in conversions, almost 27% more purchases, 79% increase in revenue from those purchases. Jay: That they already have told me that they like. Colin: Yeah, right, but this is just stuff that we, most social marketers don’t really have access to. So by looking at what people share it just becomes this incredibly powerful weapon for folks. Last thing I wanna show you here today is we’re gonna pivot over and look at Owned Posts. So we started this by talking about really the value that social presents across the entire funnel. Inc 500 executives say social is the channel with the number one impact, excuse me, number one potential to impact sales this year. How do we tell how your posts that you’re publishing day in day out as a social marketer are affecting the bottom line? What we’re gonna do here is look at these owned posts and this is gonna tell us how people are going from our posts, the impressions that we’re getting on those posts, and then again, this full funnel story all the way to the point of purchase, and then the value created from your posts. So this is total social return, which is a combination of revenue from people buying stuff on your website, if e-commerce is part of your business, and business value. And this is really cool where if you’re setting up conversions with us and let’s say it’s something like submitting a lead form, they’re not transacting in that moment but you probably know okay, based on our lead conversion rates. Jay: We know what a lead is worth to us. Colin: If you combine that with what people are sharing, you’re now combining, you now know, “When I need to post, where I need to post, “and what I need to post, and what I need “to say in those posts that’s gonna drive the most value.” So I can look at my posts that talk about Maui and now I’m gonna get the posts that are performing best when I’m talking about the Maui sweepstakes that the Seattle surf wear company is running. I can see my conversions, individual posts. And in some ways it’s almost like what more do you need to really feel confident with what you’re doing? There’s no more just shooting in the dark, “I hope this works!” You have so much confidence about what people are talking about at the top of the funnel, what they’re going to engage with, what’s going to get them to your website, and what they care about most that’s leading the conversion. You’re now producing really really high quality content and by the way, through that reporting component, you’re saving tons of time. Jay: No kidding, I love it, it’s really really smart. I like how you’ve taken this full funnel approach, it solves a lot of questions that a lot of social marketers have around value, around, “Is this actually worth the time and effort?” it’s really great. Colin: Yeah, that’s our goal, to free people up, to give them the resources they need, and what thing I can’t understate too is giving marketers back the time to actually apply these insights. We can put it on a screen, we can give ’em functionality to find stuff. One of the things I like here, one of our customers, Wedding Wire, they’re saving three to five hours a week on reporting, which is obviously a very valuable thing to do, you gotta do reporting, but not exactly a strategic activity. When you actually get that time back to channel it into doing social better and driving a full funnel impact, just Wedding Wire alone they’re seeing an 83% year over year increase in their Instagram account. 175% year over year on Facebook, which is a really powerful testament to really spending more of your time doing strategic things, less of your time doing tactical things, and having the right information to make those decisions. Jay: Well at that point if you’re gonna save that amount of time on reporting it probably more or less pays for the tool. Let’s talk about that, what does this cost and how do you package it? Is it you get all the stuff or you buy one, two, three, or four of the different components that you offer? I’ll take out the screen trailer. Colin: Yeah, sure, no problem. So in terms of, how do you buy Simply Measured? You can buy our social analytics products. We suggest most folks combine that with what we call content share tracking, which is looking at the traffic from your social posts as well as what people share. So at the very least, get that middle of the funnel. Engagement, audience growth, and traffic, basically. Jay: And that showed in kinda the Twitter megaphone, that piece of it. Colin: Exactly, you got it. At least get that spot. So that’s what we suggest folks: If you’re gonna buy one thing, at least get that. In terms of how pricing works for that, it scales up based on the number of profiles that you use, as well as the number of website domains that you want to track sharing and traffic from. We also offer the conversion tracking product which is essentially a plus up to that traffic and sharing data, which is where we layer in those conversions and purchase element. And again that’s based on the number of . . .
Jay: And if you’re in e-commerce, that’s a no-brainer right? If you’re not in e-commerce, you can probably argue either way, but if you’re actually transacting on your site, it’s like, yeah, you definitely need that. Colin: Yeah, I mean, yeah. For those . . . when we have folks come to us with an e-commerce component, it’s like you said. It’s a no-brainer. You almost gotta just start there. This should really just be a part of what you’re doing. For some of the media companies out there, some of them have really well-defined conversions they wanna track. Others are maybe more interested in just what content people are sharing so that they can produce content. They’re more focused on consumption and shareability. And then the last product, Listening. So that is based on the number of mentions that you use, depending on those topics. Listening, Social Analytics, all very friendly and suggested that you do that from a competitive angle as well to contextualize your performance and learn from what people are doing. So based on, essentially, a fee to get in the door and to access the solution, but really it’s mostly based on how many profiles you’re using, how many domains you’re using to track traffic, and how many mentions you use to listen. Jay: No additional charge for number of users, or at some level is that part of the equation as well? Colin: No, we want people to use this product. Share the data; we believe in that. So as many users as you want. Jay: Great, and when you purchase a license, do you get some time from the Simply Measured team to kinda help set it up, or what’s the services mix there? Colin: Yeah, sure. So we really believe in services. We hear a lot of folks that kinda get burned because they sign up for this product and they’re excited to do it, and they feel like they’re left out to dry. Our goal is to never do that. So all of our customers go through an onboarding process. They get a really nice handoff from their sales representative, so it’s not just kind of a cut and dry thing. We’d like to think it’s a really warm process for our customers. They do go through an onboarding process. They have access to a customer success manager who can help them both get as much value out of our product as possible and be a resource to bounce some ideas off of in terms of what they should do with social. These folks talk to social marketers all day. They have a lot of insight and context into what’s working and what’s not. And then, of course, access to our product support team in the event that they have questions about functionality, etc. Jay: Love where you’re headed. Really interesting combination of assets. If people are interested in doing a more comprehensive or personalized demo, finding out more about Simply Measured for their organization, what should they do? Colin: The easiest thing to do is to go to our website and request a demo, or we will also provide some information, I believe, through our program here today to get in touch with us, and we’d be happy to talk with you. Jay: Fantastic. Colin, you’ve been in the business for a while. You obviously know what you’re doing. You know the space and you know the market. You could work for any number of tech companies. Why are you here? Why are you at Simply Measured? Colin: The thing that gets me excited about Simply Measured, and I’m not just saying this to kind of drink the Kool-Aid, but it really is this full funnel approach. I like that we’re willing to think differently about the way that social marketers are serviced by the tools that they use. This willingness to kind of break the mold and think differently about how we help people. And not just saving them time here and there but actually helping them be better at their jobs, that excites me. I also get really excited about people. I’m a marketer, too. I’m a marketer who’s doing marketing to marketers. So I’m a marketer too, and I get excited about people. To me, marketing is really about people, and so the direction that we are going and that we’ve, hopefully . . . what folks have seen through our little presentation today is that social is about people. Social marketing is about people. We wanna teach you about who those people are and what they care about. And that’s what gets me excited. We don’t just think about how you can just blast content out in a way that’s kinda an all-or-nothing type of approach. We want to provide an experience for our customers that is unique and suits their needs and one that really they deserve because they’re marketing to people, and that kind of people-oriented approach is what gets me excited. Jay: You are familiar with a ton of technology, not just your own. What’s a marketing marvel for you? What’s a technology solution for marketers that you really enjoy? Colin: What I geek out on? Prior to coming into social, I worked in digital advertising. So I managed paid search campaigns, targeting campaigns, display ad buys. So I like geeking out on some of the RTB stuff. The process of how . . . I’m really fascinated by the way display advertising works. I love the concept of attribution and the way that we look at people’s journey across multiple touches. That’s the kind of stuff that I get really geeked out on. So some folks out there . . . like a local company here in Seattle, Visible, I think they do pretty interesting things, especially with B2B attribution. So that’s where I kinda geek out. Obviously, just like you do, Jay, I try to read a ton and stay up on things. So kinda my little treat to myself when I go outside of social is usually in some of the digital advertising space. Jay: Nice. You’re like a programmatic nerd. I got. It’s all good. Colin: I am, I know. I didn’t think that I would be when I kinda got into that, and it turned out I’m a much bigger nerd than I thought I was. Jay: It’s okay; secret’s safe with me. Jay: Colin, thanks so much for being here. Congratulations on all the progress at Simply Measured. Love the full, four-component stack, the full funnel social analytic solution. If you are in CPG, if you’re an agency, if you’re in travel, if you’re in retail, if you’re in e-com, it is absolutely a solution. Obviously, even if you’re in B2B, you can put custom evaluation on website events such as a form fill-out, an email subscription, a webinar, registration, etc. Tie all that back to your social, including the dark social stuff which is super super important. I can’t emphasize enough how critical that’s gonna be for everybody. Definitely take some time, do a full demo, talk to Colin and his team, and see if Simply Measured can help you. Colin, thanks again for being here. It was awesome. Colin: Thanks a lot, Jay. Jay: You bet. Ladies and gentlemen, this has been Marketing Marvels. If you want to make sure that you never miss an episode, and I think that’s a good idea because we bring you fantastic solutions every time, and everybody that we bring on this show is stuff that I personally know and support, go to bit.ly/marketingmarvels, all lowercase, bit.ly/marketingmarvels. That’ll take you to our subscription page. You can just click a button and make sure that you get alerted every time a new episode comes out. That would be a swell idea. We could actually track that with something like Simply Measured. On behalf of everybody at Convince & Convert Media, who produced the show, I am Jay Baer, founder of Convince & Convert. He is Colin Zalewski from Simply Measured. This has been Marketing Marvels. Thanks for watching.